There are many notable peace makers who are famous in recent history. Two of them are Nelson Mandela and Gandhi. One many have heard about, and the other some might not have heard about. However, they both are well-known for many of their good deeds. After reading this article, you should have a better understanding about both these men and what they are known for, and how these two go together. At this moment in time, some might have little information about them. Here are some of highlights you may or may not know, but still remember that each man was great in his own way. They were both leaders, but in different areas. Gandhi was a leader of India. Nelson Mandela was a leader of South Africa. However, both of them have South Africa in common as Gandhi followed his sense of morality to become a political activist and champion of non-violent revolution in South Africa for the Indians living there, after he saw how they were treated when he went to practice law in South Africa. He was only visiting in South Africa at the age of 24 when he was treated with extreme prejudice. He then extended his stay as he saw terrible injustice and felt compelled to begin a political party in 1894 to represent the Indians living there. Eventually, the South African government struck a compromise with him. He promoted peace in South Africa as well at home in India and politically was very much a catalyst to galvanizing the entire country of India together to practice a non-violent revolution against the oppressive British Army ruling over them in India. For this, for the freedom India attained as a consequence and for mindfulness he promoted and encouraged, many Indians worship him. Mandela started out adopting Gandhi’s peaceful ways but along the way adopted violent measures, only to return to the peaceful practices we are familiar with today. Both Nelson Mandela and Gandhi are well-known in their countries as very honorable men for the changes they made. Both of them worked to change their countries for the better. 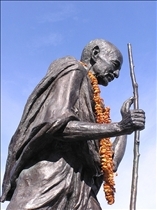 Gandhi is thought to be an icon of peace in his country. Some Indians, however, do not agree with his decision to go along with splitting India into two countries, namely India and Pakistan. While Nelson Mandela was given his own honorary title after he had become President of South Africa. Both Nelson Mandela and Gandhi had seen the discrimination that went on in South Africa. Nelson Mandela had a hand as well as Gandhi to see a reconciliation of the people in South African and the Indians there. While Gandhi achieved success in leading the Indian people of India, Nelson Mandela fought for his native South African people. However, as both fought in their own times, each finally came to an agreement with the ruling party in their own lands. 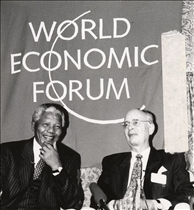 For Mandela, this reconciliation didn't happen until after his 27 year imprisonment. Both of these men also worked, once they had reconciled, to bring more things to light in their countries and try to come to some tangible conclusions to help their people. Both men are noteworthy. One had some problems before he became the man he is known as today. However, both men also worked long after they were in their prime years. Gandhi's legend is said to be one that many people think back on reverently. However, many have never heard of Nelson Mandela. Those who have heard of Nelson Mandela often know only of the his anti-apartheid movement. Nelson Mandela began his career adopting Gandhi’s non-violent policies and went on to start an anti-AIDS movement in his country. Gandhi had started out practicing non violence. Nelson Mandela began acting along the lines of non violence at the beginning of his career but used violent methods after he concluded that non-violence yielded no results. He again adopted non-violent methods following his release from prison. Mandela is credited with establishing the ANC rule in South Africa and for establishing anti racial policies in his country. Gandhi was credited with leading a huge non-violent protest against the brutal ruling British Army in the form of encouraging Indians to make their own salt at the seashore rather than pay the British salt tax. He is also credited with leading India into freedom of Indian self rule. Which peaceful resistance leader is more famous? Nice .but if you try to write as point wise it will be easy to understand and to read. helped my project a lot. "However, many have never heard of Nelson Mandela"
LOL, next to Coca Cola, he's the most recognized name and face in the world.